Full Installation shot in the main hall of Hamburger Bahnhoff Museum of Contemporary Art of the "alter/chapel" with the backdrop depicting a scan of brain neorons whilst reading. Installation shots/performance shots of "THE READER," and the backdrop depicting a scan of the brain while reading a book. A perfomative installation that was both a personal poem and paen to books, the act of reading, and the "pre-digital experience" that occurred (and still occurs) in the mind during the process of delving into the abstract world, the age-old "virtual reality” experience that happens during the act of reading. The piece was an acknowledgement of the recent transformation of reading-once a prosaic activity-into one of a curiosity and spectacle leading us to the point where reading may soon actually become a "transgressive act" in the future. "Picture if you will a time in which books and reading are obsolete. Reading has become an act both religious and sexual. Priestess "Readers" performs a ritualistic act of book worship, snaking their way ceremoniously to a make-shift tented cocoon swathed in a primitive rendition of the neurons of the brain while reading. Once inside, the anonymous priestess (clothed in a full body suit to protect her anonymity), enacts the extinct, now illegal, and therefore titillating "acts of reading" that excite the spectators with their taboo eroticism and comfort them with their banal nostalgia. " A pop-up thematic Group Exhibition organized by the artists of my studio complex, ECC Berlin. I produced three small works around the inspiration of STARS. A themed Group Exhibition at my studio complexes gallery Tosana-Halle during Berlin Art Week. I produced a large scale piece inspired by the theme: OPIUM using safety blankets that were featured in the media present stories of refugees from the near east and structures and colours that spoke both to Eastern cultures and the historical exotification and romantification of a deadly drug. KOMMUNE 5 was a themed exhibition at Toscan Halle of artists at my studio complex, ECC Berlin. The theme came into being based on the history of the building in which the studios are found. It was built during the time of the Kaiser, was then offices, (with prisons in the basement), during Nazi times, then post World War 2 was taken over by the Russians, then by the DDR regime, and now is a studio space for artists, musicians, designers, and many Syrian refugees. 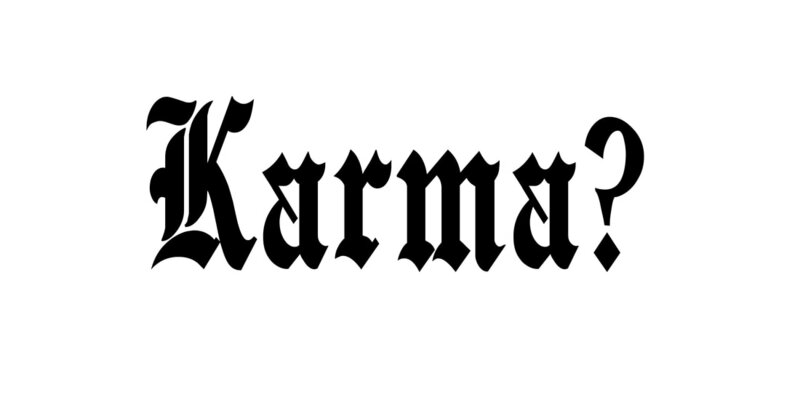 I made five conceptual silkscreened work using the traditional German Gothic font and my name to question the KARMA of each of the different political powers that have enacted/carried out their actions/activities in the space. 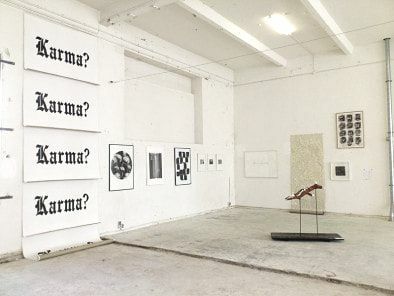 A curated themed art exhibition featuring artists who work in Abstract Art at Toscana Halle ECC Studio Complex Berlin. 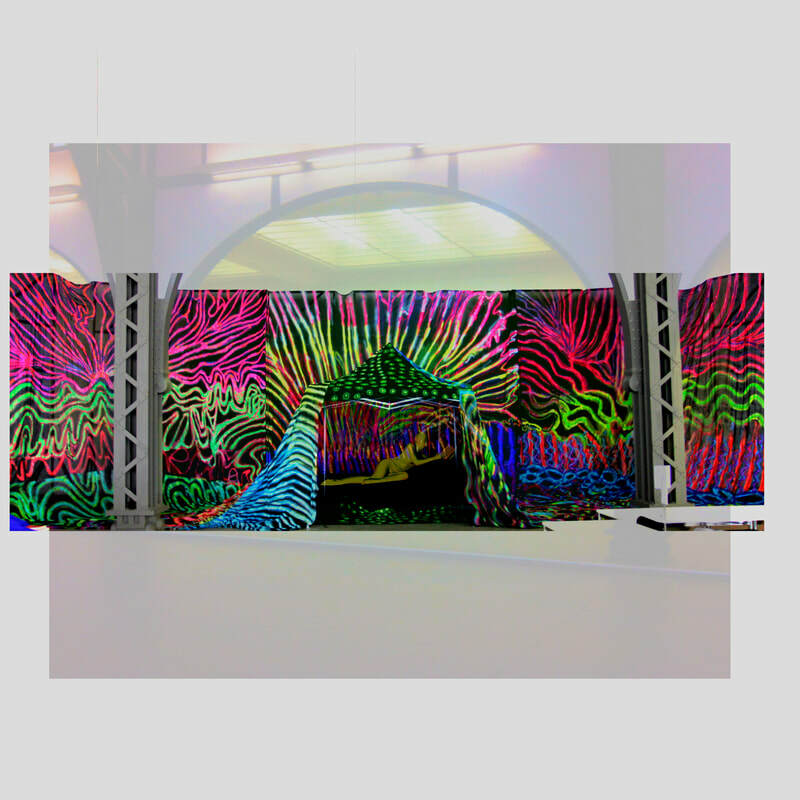 I produced two large scale painting installations, and showed a series of smaller works and one large scale work.